Since we’re a Disney loving family, the boys were introduced to Disney princesses at a very early age. They met them for real in Walt Disney World in 2013, and before that Jensen had already bought his first Disney Animators’ doll from the Disney Store. The princess had to be Ariel, despite me thinking he’d pick Belle, Snow White or Pocahontas. But no, Ariel was his favourite – and it’s never changed. I’ve got a feeling it’s genetic – I even mentioned Prince Eric [I’d been famously searching for my own Prince Eric when I met Gavin] in my wedding speech when my husband and I were married in Walt Disney World, and I might be one of the only grown ups I know who can sing the whole of Under the Sea. So I think it’s safe to say it’s hereditary. 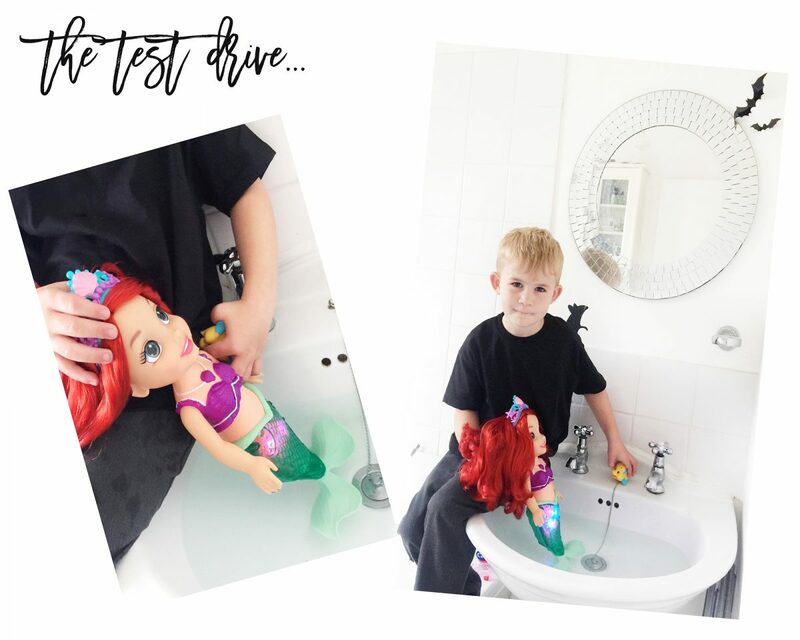 Our Animator’s doll sadly isn’t with us any longer and so when we were offered the opportunity to try out a new Colours of the Sea Ariel doll, I knew the boys would burst with excitement. She sings “Part of Your World” from the Little Mermaid [which makes you sing along too]. She has 14 magical phrases – and can say them in Spanish and English if you flip a little switch behind her neck! Ariel is activated by pressing the little shell necklace around her neck. Her tail lights up when touching the water – around where her pants would be if she were human. The light is swirling and so pretty. Flounder comes with Ariel, and he’s a little bath toy that can squirt water. Ariel has a little Princess tiara with her, and long hair that can be combed and styled. The test photos for this are taken with my iPhone sadly because our bathroom is so small that I can’t back up enough to fit anything into the frame. 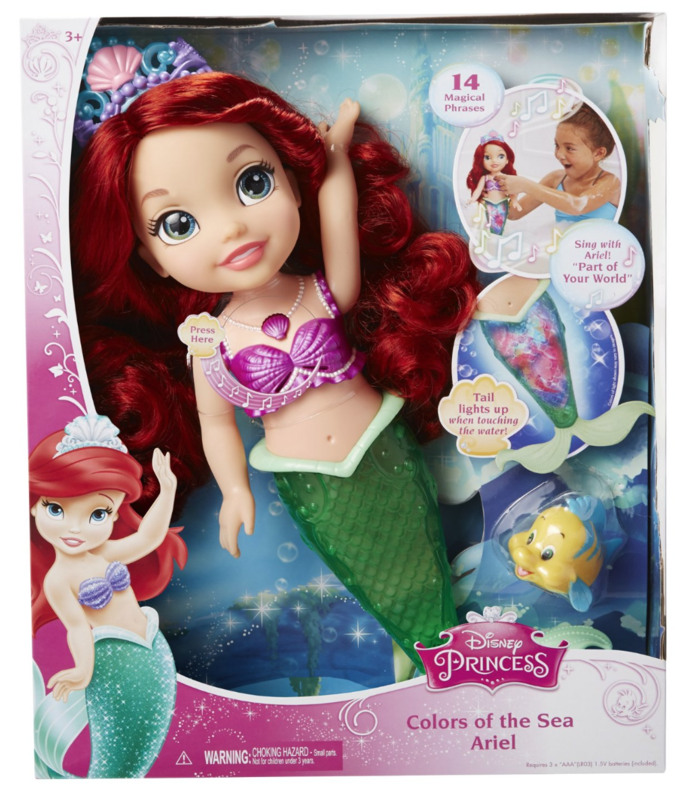 That Ariel comes with her little Flounder who can squirt water and play – this means that two boys can play instead of one. Ariel’s hair hasn’t become matted after playing in the water! After careful instruction to try and keep her hair dry, part of it still did but to our surprise, it hasn’t become like straw and matted up, it’s still silky and been combed beautifully by Jensen to keep his Princess looking her best. The eyes – our old Ariel had painted on eyes, but these eyes are 3d, and glass-like, which means she looks more realistic. They’re so beautiful. That Ariel can stand up on her tail! The sounds from Ariel – they’re clear and not at all tinny. She sings just as she does in the film, and the lights are diffused, whimsical and rainbow coloured. That she can switch from English to Spanish so easily – our boys have already learned some Spanish from her and love repeating her phrases to each other. How durable Ariel is. She’s a toy that can be played with without fear of an arm falling off. That the batteries were already included – she was out of the box and ready to go! There was an option for the light show without the noise – that way she would make an amazing nightlight too! That there weren’t those little plastic tag things used to hold the tiara in place. In so many plastic toys with hair, this is my biggest annoyance. Honestly, I wonder if the people who make the toys actually ever play with them. Ariel’s tiara is affixed to her head with a plastic tag. The one end extrudes from the end of the tiara, and can be snipped off. It then leaves the other end embedded in her head, with a sharp poking bit of plastic sticking out. I cut them as close to the head as possible, but they still poke or scratch. They’re so annoying on plastic toys. Ariel could sit down. She would be brilliant in water if she bent in the middle to play with – and her hair would be less wet each time. That Ariel’s little tiara was stronger, and stayed in place – it’s snapped already and we’ve used some superglue to fix it, but it’s not really made for putting on and off again. Jensen wanted Ariel to be able to wear it, but it slips off constantly. That the sensor was more sensitive – after reading the instructions, to activate the light show in Ariel’s tail you can either press and hold her shell necklace for five seconds, or immerse her tail in water. It seems as though the water immersion works once until the sensor inside the tail is completely dried out – the boys watched her tail fill up with water and were pretty unimpressed that she couldn’t sing as she swam in and out of the water. I think I remember this happening – I’ll take a look! I think it was a switch on the back of her neck but I will check for you!